The Tibetan Spaniel is a very ancient breed and may have existed before 200 B.C. Differing theories exist regarding the breed’s origin. One states they were descended from Pekingese given to the Tibetans by the Chinese. 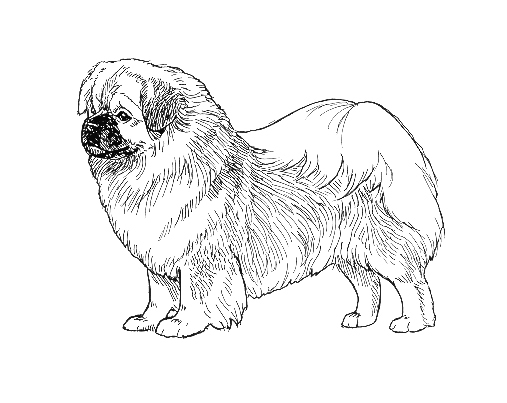 Another states that the Pekingese is descended from Tibetan Spaniels given as gifts by the Tibetans to the Chinese. The Tibetan Spaniel was cherished by the Tibetans as a bed dog and was thought to bring good luck. In the monasteries, Tibetans served as companions and, using their keen powers of sight, acted as lookouts, lying on the walls to bark a warning. It is said that these highly treasured dogs were given to Emperors or very important people as a tribute and were brought to England in the late 1800s. Tibetans are not true "spaniels," but were given their name to distinguish them from the Tibetan Terrier. The Tibetan Spaniel was recognized by the United Kennel Club in 1992. The Tibetan Spaniel is a small, active and alert breed, with a moderate amount of silky, flat-lying coat that comes in a variety of colors. It is a well-balanced breed, slightly rectangular in proportion. Tibetan Spaniels are gay and assertive in temperament. They are highly intelligent and aloof with strangers. The head is small in proportion to the body. It is carried proudly, giving an impression of quality. It is masculine in males, but not coarse. The skull is slightly domed, and moderate in length and width. There is a slight, but definite stop. Medium in length, blunt, with good cushioning. Free from wrinkle. The bottom jaw is deep and wide. A full complement of strong, white, evenly placed teeth meet in a slightly undershot bite, the upper incisors fitting neatly inside and touching the lower incisors. They are placed wide and evenly between the canines. A level mouth is acceptable, providing there is sufficient width and depth of chin to preserve the blunt appearance of the muzzle. Teeth must not show when the mouth is closed. Faults: Overshot bite. Protruding tongue. The oval-shaped, medium-sized eyes are set fairly well apart, and forward-looking. They are dark brown in color, bright and expressive. The eye rims are black. A black nose is preferred. The medium-sized, pendant ears are set fairly high. They are well feathered in the adults. A slight lift from the skull is acceptable, but they should not fly. Large, heavy, low-set ears are not typical. The strong, moderately short neck is well set on. It is covered with a mane, or "shawl,” of longer hair, more pronounced in males than females. The shoulders are firm and well laid. The forelegs have moderate bone and are slightly bowed. Dewclaws may be removed. Faults: Very bowed front. Very loose front. The body length, measured from the point of the shoulder to the root of the tail, is slightly longer than the height, measured at the withers. It is well ribbed with good depth. The back is level. The well-developed stifles show moderate angulation. The hocks are well let down. The rear pasterns are straight when viewed from behind. Dewclaws may be removed. Faults: Straight stifles. Cow hocks. The small, neat feet are hare-footed, with feathering between the toes, often extending beyond the feet. The richly plumed tail is set high and carried in a gay curl over the back when moving. There is no penalty for dropping the tail when standing. The breed is double coated. The coat is silky in texture, smooth on the face and on the front of the legs. It is of moderate length on the body, but lies rather flat. The ears and the back of the forelegs are nicely feathered. The tail and buttocks are well furnished with longer hair. Males tend to carry more coat and mane than females. Neither is to be over-coated, and no trimming, except for the bottom of the feet, or excessive grooming measures is allowed. All colors and combinations of colors are acceptable. Ideal height is approximately 10 inches. The ideal weight range is from 9 to 15 pounds. Quick moving, free, positive and straight.